Pigs in the parlour and pimps in the pulpit – AH! the fresh smell each Sunday morning of pure unfiltered BS! 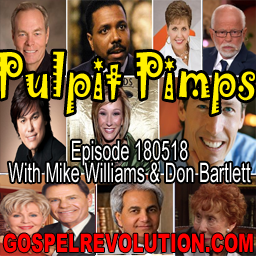 This week Mike unloads on preachers who specialize in half truths, outright lies, and bully pulpiting. Contributors include Doug (I am my own Grandpaw) Salonen, Pat Rouse Salonen, Barry Laney, Yvonne DeCleene, Brenda Witmer, and a surprise guest appearance by Jimmy Bakker. Copeland, Baker, none of these rats can keep a turtle in a tank alive for a year let alone grow a limb out. There is no check and balance system in christianity by those who supportive it. Why dont christians demand to see results ? ? ? ? I hate these S.O.B. pulpit pimps. Great name for these rats. I love when you guys expose these frauds. But life is good and I’m a happy guy. I have sat in Marilyn Hickey’s church numerous times and sang on her stage specials. Yes I am a singer. I admired her at the time and as you could not believe I was afforded the opportunity at the time to sing on her stage. Now I could care less and see the errors of my ways. LOL…I have listened and followed most all the so called famous word of faith teachers and tried my best to indoctrinate myself with their tapes and cd’s. I went head over heals into this type belief system. I made sure I listened to their teachings (Copeland, Hagan, Norvel etc.) I let hours of their doctrine seep into my spirit (haha) This was serious business to me at the time. Building my faith with their teachings was my goal. I walked it, talked it, believed it for years and IT DON’T WORK! Now after being untaught by the gospel I understand what poison it all is. Many Jerks still out there jerking people around for money power and fame. Remember what Paul said in his day. This stuff has been going on for thousands of years. He said with feigned words will make merchandise of you, and another warning where their damnation for long lingereth or slumbereth not, but it was in those lines, that bible verse mentioned two things for those false teachers. The Catholic church selling indulgences, then we had OSAS once saved always saved, there has been reports of believers going to hell over one sin, Acts 5. And now we have the health and wealth gospel which seems to have done more damage to the body of Christ then any sexual sin has accomplished.